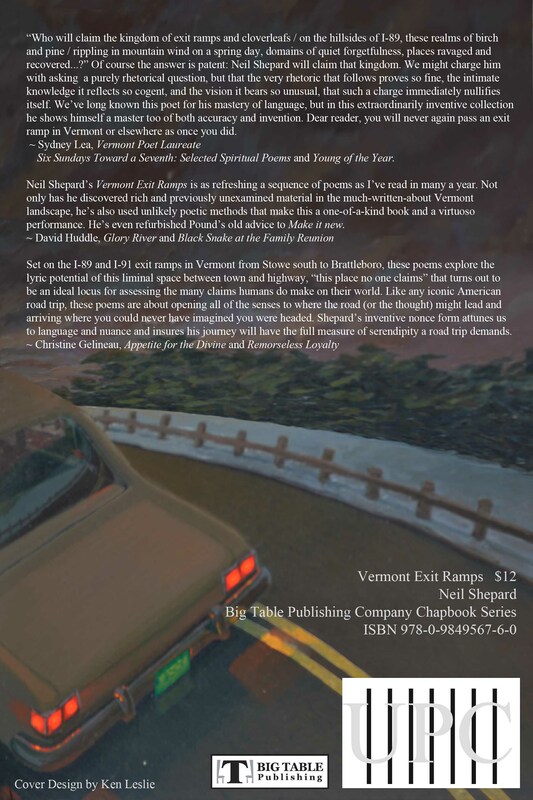 Neil Shepard has two new books: a full book of poems, (T)ravel/Un(t)ravel (Mid-List Press, 2011), and an offbeat chapbook, Vermont Exit Ramps (Big Table Publishing, 2012). His three previous books of poetry are Scavenging the Country for a Heartbeat (First Book Award, Mid-List Press, 1993), I’m Here Because I Lost My Way (Mid-List, 1998), and This Far from the Source (Mid-List, 2006). His poems appear in several hundred literary magazines, among them Antioch Review, Boulevard, Harvard Review, New American Writing, New England Review, North American Review, Paris Review, Ploughshares, Shenandoah, Southern Review, and TriQuarterly. His poems have also been featured online at Poetry Daily, Verse Daily, and Poem-A-Day (from the Academy of American Poets). Shepard has been a fellow at the MacDowell Arts Colony and the Virginia Center for the Creative Arts, and he has been a visiting writer at the Chautauqua Writers Institute and the Frost Place. He founded and directed for eight years the Writing Program at the Vermont Studio Center, and he taught for several decades in the BFA Creative Writing Program at Johnson State College in Vermont until his retirement in 2009. He also founded the literary magazine Green Mountains Review a quarter-century ago, and he is currently its Senior Editor. He presently lives in New York City and teaches poetry workshops at The Poet’s House and in the low-residency MFA writing program at Wilkes University (PA). Outside of the literary realm, Neil is a founding member of the jazz-poetry group POJAZZ. Perhaps these poems do, with their quiet focus on what most of us driving in the US usually drive past, or stare at, unseeingly, or merely use as stray anchor/moment to catch up with our thoughts. When you wrote these poems, was that focus (on exit ramps and the life inhabiting/surrounding them) intentional, did it evolve in some way, or just unfold on the page? 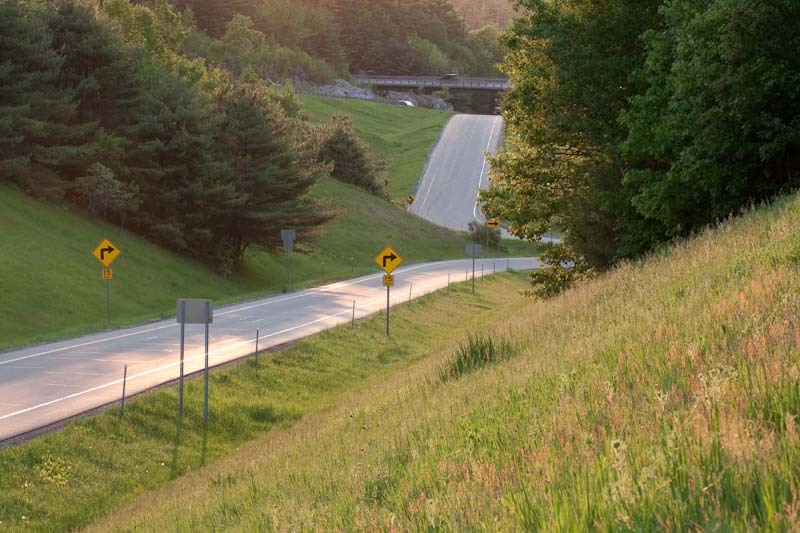 Neil Shepard: Perhaps in other parts of America the exits off highways offer nothing special, but in Vermont, where I live, many of the exits are beautiful little unclaimed pieces of meadow or woodland that I started calling, generically, ramplands. I’m intrigued by places that have been ravaged and recovered, places that were dynamited, bulldozed, ruined. Then, once the forces of “progress” move elsewhere, these places regenerate and reclaim their little domains of marsh grass, pine grove or granite vista. I had no overarching plan or theme for all of the exit-ramp poems. I didn’t know how many ramps I would visit. My only rule was to observe, distil, crystallize my impressions, and then to create a form that might in some way mirror or reveal the exit-ramp’s “content.” Three days later, I had reached the Massachusetts border and had visited every exit along the way; thus began, in earnest, the full project, a chapbook’s worth of poems called Vermont Exit Ramps. 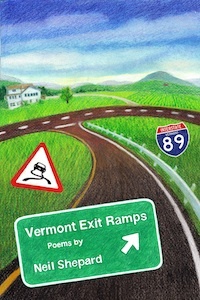 RD: You have a date and time stamp on many of these poems, especially the ones highlighting the exits off I-89 and I-91—did these arise from a single trip? 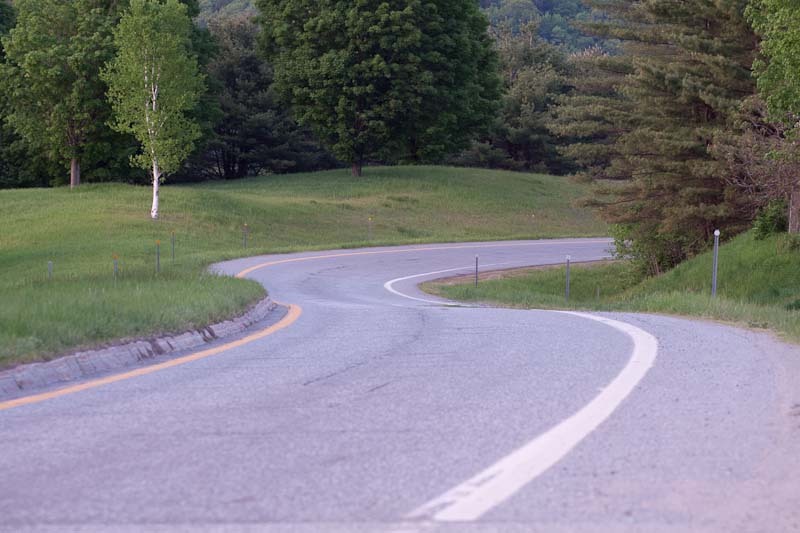 Let me tell you about my first day of writing these poems: I was parked at the Stowe exit, pulled far off Route 100, and I was drafting my first poem(s) about Stowe and Waterbury. Fifteen minutes into the process, flashing blue lights appeared in my rearview mirror. A police officer approached the car and asked why I was parked on the side of the road? So I told her: “I’m writing exit-ramp poems, officer.” And I showed her my handiwork. “Would you like me to put you in one of the poems?” I asked. Though she declined, she seemed amused. At least she didn’t give me a traffic ticket. Instead, she gave me advice, listing the rules of the ramps: no pedestrians allowed on the exit-ramp tarmac or on the cloverleafs of land nearby! No pedestrians, hitchhikers, stopping for hitchhikers, animals, farm vehicles, snow machines. Nothing but proper, motorized vehicles, humming along on their way elsewhere! Well… she probably saved me from future traffic fines, so I thanked her, asked if I could stay where I was, and she said, “Yes, for a little while, but not for too long, let’s say, only as long as it takes to write a poem, which can’t be too long, right?” Right. RD: There’s a line to keep! NS: Yes, perhaps it’s a new poetics, “flash poetry,” caused by the flash of an officer’s badge. RD: As your poems dip in and out of towns in Vermont, we also dip in and out of time, rubbing shoulders with road crews, “men of stone” blasting through the granite of Vermont, “loggers felling trees on a ski slope,” skiing from Sweden arriving, sheep farming ceding to tourism—the past comes alive —how important was the history of these places as you wrote? NS: At first, I was only interested in observing, moment by moment, the natural world around each exit; one might call it the habitat of the ramplands. Once I turned my attention to the human impositions on the land, I began to think about how time alters both natural and human worlds. 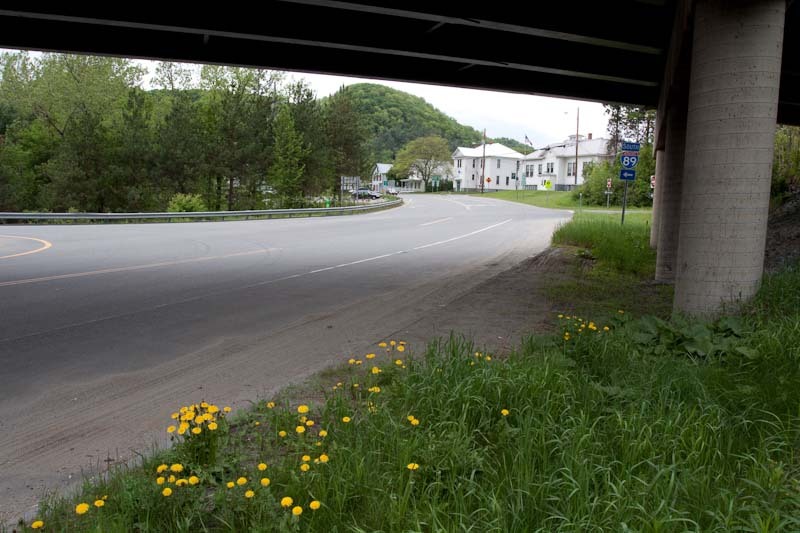 And I began to focus as much on the past as the present – both the geological layers of Vermont (granite), the ruination and recovery of the flora and fauna around these exits, and the human layers of history (going back to the beginning of European settlements in Vermont). I realized that each exit had a history, both public – which I could research in the nearby towns’ historical records (town halls or libraries, or Google) – and private – my memories of traveling up and down these highways for forty years, often hitchhiking, often stranded at exit-ramps, often visiting friends and lovers in various towns nearby. Over time, a lot of the public and personal history began to inhabit these poems and bump up against the natural world descriptions. RD: I was intrigued by the voice in the poems—the variously remote, erudite, urban and urbane voice, or satirical/faintly sour. In earlier collections (e.g., This Far From the Source) you have written the lyric “I” extensively, but you’ve also played with voice and persona ((T)ravel/Un(t)ravel)—were some of these poems in Vermont Exit Ramps persona poems, or would you say they were autobiographical in main? NS: Well, several poems do have the stain of autobiography, but almost without exception, the details have been changed, augmented, or invented for greater dramatic arc and purpose. In many other poems, the poet is reduced to an observing eye, an “I” almost erased of personality, or if there are signs of personality, they reside in both what is selected for observation and how it is observed (i.e. how the poet responds to the stimuli). The multivocalic style of these poems comes from my desire to create a formal equivalent for the layering that is an intricate part of Vermont (or any constructed landscape): thus, I overlay the personal and the public, present and past, natural world and human world, reportage (fact) and invention (anagrams, fortunes, birdcalls, found-phrases), intentionality and serendipity, all at the service of mirroring the layers of a made place. 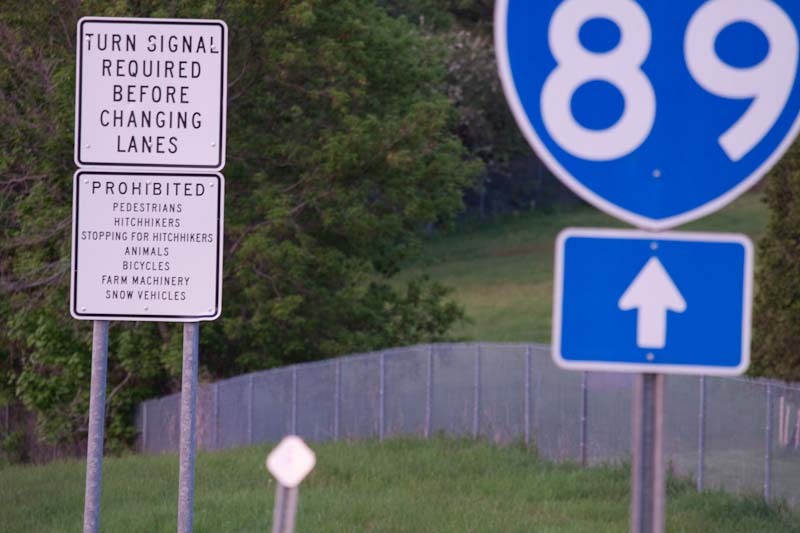 RD: Yes, it’s impossible not to notice there’s a lot of post-modern, wry, tongue-in-cheek wordplay, puns and anagrams (Montpelier’s pee-lit morn, triple omen), bits from highway signs interspersed (Please Merge Early)—how do these experiments or games with language arise? NS: I wanted to balance intentionality with serendipity in these poems – after all, so much of what happens, historically, is a matter of chance overlaid on human intention. I’m often worried about strong-arming a poem with too many preconceived ideas—as you can see I’ve done with these poems! Especially when I’m immersed in a subject that requires or promises research – oh, joy! Googlemania! – I can become unbearably referential, wearing my erudition (rather than my heart) too visibly. So, I was looking for ways to counter too much intentionality. Beyond my normal penchant for puns, I introduced another variable: I used an anagram scrambler to scramble the town names in two- and three-word permutations. For instance, Stowe becomes so wet or to sew. I snuck some of these phrases into the poems, a sort of secret code. By design, I once attended a craft-talk given by Heather McHugh at the Vermont Studio Center in Johnson, and by chance, she was talking about her use of anagram scramblers in the making of poems. I was hooked…but I didn’t discover the opportunity to use this technique until I arrived at the Vermont Exit Ramp project. RD: The Chinese cookie fortunes made for a fascinating inclusion too, and offered more for that urbane voice—how did they first find their way into your work? NS: After I learned about anagram scramblers from Heather McHugh, I used them in my own poetry workshops when we talked about offbeat constraints a poet might impose on the poem (from number series, to anagrams, to “found” texts, to Oulipo games, and, finally, to fortunes from Chinese cookies). I came up with that last one on my own. When I taught poetry in the schools, especially at the grade school level, I not only brought in each student’s name with all of its 2 and 3 word permutations run through an anagram scrambler, but I also gave them each a fortune cookie, with instructions to eat the cookie and use the fortune and several anagrams in a poem of their own creation. For the Vermont Exit Ramp poems, I bought fortune cookies at Chinese restaurants near these exits, and I selected several fortunes, at random, to slip into each exit-ramp poem. So, each rampland has a secret code and a forecast for its future. I guess you could say my teaching strategies led me to adopt new techniques for my own writing when I considered it appropriate to the work at hand. RD: But every now and then the voice slips more elegiacally into memory or nostalgia or slams into straightforward emotion, as in the heart-stopping poem “Turn in Guilford” with its unexpected twists—what lies behind such a switch? NS: The exit ramps are a perfect nexus (almost an anagram of exit) for exploration, a liminal zone between coming and going, not anywhere in itself but promising much except the possibility of backing up. For me, this place is metaphorical, almost archetypal – ever-changing, ever–transitioning. So, I often transition in this book from poems (almost) wiped clean of the ego, to poems loaded with the self’s interests, obsessions, and nostalgic memories. Because I have lived in Vermont, off and on, for over 40 years, many of my memories were made (and unmade) here. “Turn in Guilford” reaches back to a memory from my college days. In a book with as much textural variety as Vermont Exit Ramps packs in, I wanted it also to have a capaciousness of mood (comic/elegiac), mode (lyric/narrative), and style (confessional/collaged). RD: You are able to rather consistently juxtapose the delicacy of imagery in landscape with a rather more banal description of place—for instance (I-91: Brattleboro), chipping sparrows vie with farm-boys and coaches with beer-guts: is this a deliberate attempt to balance out the lyricism, do any poets in particular inspire that kind of inclusion? 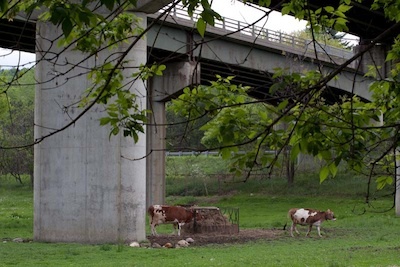 NS: I think of Vermont Exit Ramps as a book of post-pastoral poems. Vermont still has its bucolic pastures and hillsides, but the human population keeps growing, and it demands more consumer goods, boxy malls, bigger houses, faster roads, and all the rest of it that bedevils us in this late-capitalist culture. So, yes, I consciously wanted to balance the poems’ pastoral lyricism with more banal description. I wanted a palimpsest of American history, from the primeval (granite, before ferns, virgin timbers) to the plasticization of modern culture. 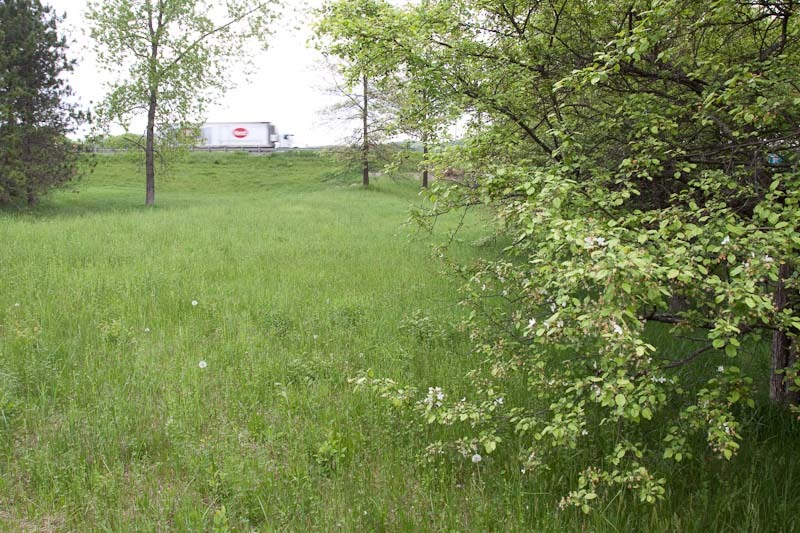 Each exit features a small world of earth and pavement, wires, signs, and other detritus that Americans have an intimate acquaintance with but probably give scarce thought to, but the ramplands also feature the ever-recovering wild and beautiful grasses, flowers, and trees. The poet delivers reportage about Vermont in the 21st century, but we know where his heart lives: along the wayside with nurturing green ferns, “something not under enormous pressure for millions of years to perform in our fuel tank. Something alive, present, nimble in sunlight/and shadow,” as I say in the exit-ramp poem about Middlesex. RD: I loved the panoramic feel to the book—the farms and saw mills giving way to granite quarrying, the rooting in time—the Civil War markers, the Woodstock and “hippie” references—there’s a Whitmanesque sprawl to the poems, a distinctly American feel, echoes of Sandburg, and William Carlos Williams, Ginsberg, Kerouac, any one who has written in sweep—as an observer, or traveler— about a geographic place—yet these poems seem to have grown out of a lifetime of living and working in the place observed, being close to the land as it were—were there questions about place or identity you were trying to resolve or explore here? NS: Like Whitman, Sandburg, Ginsberg and Kerouac, I have traveled much in America. In my hippie days, I hitch-hiked from coast to coast, many times, and felt that American expansiveness about which Whitman and, later, Kerouac wrote. Also, like Whitman (in Manhattan), Sandburg (in Chicago), and Williams (in Paterson), when I returned from my travels, I returned to a specific, well-loved place – in my case, Vermont – a place worthy of poetry. In the forty years I’ve identified myself as a Vermonter, I have watched the landscape change, felt the pace of life quicken, and noted the tensions between public and private property. I, too, have changed in these forty years – from a twenty-year-old college student of the counter-culture, to a sixty-year-old professor who still leans decidedly Left, who still holds “progressive” values. And yet, the 60-year-old is a family-man, a responsible worker and citizen, a poet and teacher, a man who loves his cultural and domestic pleasures, who has become somewhat that comfortable bourgeois against whom my young anarchist self would have ranted. So, in some of these exit-ramp poems, I am calling across the distance of those years, back to the more free-spirited version of myself, in a way to determine who I (imagine I) was. To the extent that Place locates me in a specific time period, I use it to explore issues of identity. 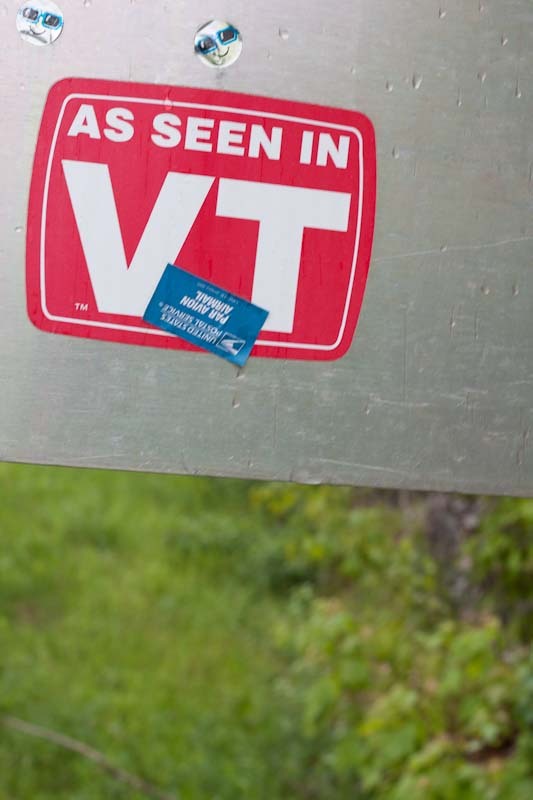 However, no matter how many years I live in Vermont, it will never be long enough to make me a “true Vermonter,” someone with seven generations (or even one!) in the ground. Therefore, I am a person from “away,” a person who, both by temperament (as a writer) and by fate (being born elsewhere), stands outside of the small-town community, certainly outside the inner social circles composed of citizens whose family-names are chiseled on the stones of the first plot-cemeteries. RD: That brilliantly articulates what to many of us—travelers across states and continents–in this century and country is a reality. NS: My attachment to Vermont (especially, to its past) has always been an imaginative, rather than a familial one, a matter of self-creation rather than of lineal heritage. Because I am a writer with an affinity for the natural world, somewhat in the tradition of Robert Frost and somewhat in the tradition of American transcendentalists (Emerson and Thoreau, both of whom were my Massachusetts brethren – though separated by a 150 years — they in Concord, and I, 20 miles away in Leominster), I do find a sort of heritage here in Vermont, a kinship with writers who were imaginative stewards of the land. Whenever I write about Vermont, I am aware of myself as both an actual outsider and an intellectual/imaginative insider. For instance, I live on a hillside in Johnson, with several acres of land and mountain views. The house I live in was designed by my wife’s father, a stage-set designer, with help from an architect who made sure there would be a workable “fourth wall.” Various other friends and colleagues with architectural, construction or landscaping skills also helped us create this place. And finally, an old Vermonter named Waldo, who has lived a lifetime in Johnson, built our chimney and regaled us with stories as he worked (or didn’t work). He explained that our upland pasture used to be the town center. Here’s a long excerpt from a poem I wrote about his troubling presence: (“Excoriating Ghosts”). So, to come back to your question, yes, I’m always trying to work out my relationship to Vermont, both the 21st century in which I live, as well as the several centuries of habitation that precede my own moment in sunlight. RD: Grace Paley has said, in an interview with Ilya Kaminsky and Katherine Towler for Poets and Writers, “I don’t feel national pride or anything like that, but on the other hand I’m very interested in this country. I’m very interested in the history of it, and I feel that it does have some valuable ideas that really have transformed many people.”(She went on to talk about her parents coming as immigrants escaping from Russian pogroms in the 1900s and of the visceral ways in which immigrants from there and other parts of Europe were able to come here and rebuild their lives.) Your poems too offer us urbane observations on the state of the US today yet carry hints of a private visioning of place and belonging—what informs your own perspective on notions of nationalism? NS: I do share a few things with Grace Paley. Both of us moved from elsewhere to live in Vermont. Both of us have forebears (in my case, grandparents) who escaped the Russian pogroms. My forebears settled in New York City, some in Fitchburg, Massachusetts, some in Lewiston, Maine. But I grew up a generation after Grace, and unlike Grace (who lived in NYC), I grew up in a Massachusetts mill-town with a small Jewish population. My parents were involved in the cultural assimilation of the mid-20th century. My father, Stanley Shepard Supovitz, shed his surname and became Stanley Shepard. My mother, descended from serious scholars of the Torah, turned away from Orthodox Judaism, toward a less severe, less committed relationship to faith. Both parents, though culturally identified as Jews, did little to inculcate the love of this religious tradition in their children. Not surprisingly, I am a fully lapsed Jew, with more affinity for Buddhism than Judaism. But I am really post-religious. I have never had much use for organized religion, be it church, synagogue, or Buddhist temple. As I suggested earlier, I’m much more interested in the American Transcendentalist tradition of a personal relationship to spirituality, with divinity residing inside each one of us. RD: I’m just amazed at all these connections! NS: Maybe it’s just the usual six degrees of separation that ties us all together, no matter where we live… but back to your original question: Though I’m interested, from an intellectual perspective (especially, as a student of American literature), in the ongoing definition of what it means to be an “American,” finally, I don’t have much use for nationalism. Like religion, it seems to breed intolerance, war and death as often as it ignites anything noble in the human spirit. By contrast, I’m interested in both the local and the international. The local offers, at best, a place small enough so that we might begin to talk across the borders of our differences. At the local level, we must look at the folks with whom we disagree, rather than send missiles raining down upon them from afar. And if there is agreement in the local community, so much can be accomplished! – so much more cooperation, so much less red-tape, finally, at the local level. Secondarily, as an international traveler (and sojourner in places such as China and French Polynesia), I’m interested in the behaviors of our human family in all its linguistic and cultural diversity, and I’m constantly reminded of the relativity of (and the provisional status of) any of our beliefs. Finally, if you take my interest in American Transcendentalism (with its focus on self-reliance and a personal relationship to nature and spirit) and you combine this with my interest in the local (community on a manageable scale) and my interest in the global (the variability of life on earth, as well as its interconnectivity), then you might arrive at poems similar to the ones in Vermont Exit Ramps. RD: There’s a sense of physical movement in these poems—we are with you as you drive across Vermont, propelled forward into the gritty landscape of “a shorn place,” or the “prettiest small town in America” –you have written about your travels before, overseas, especially in Travel/Untravel, though all your books seem to carry travel at their core, as fact or metaphor—yet these travels, inside the US, inside Vermont, from a Vermont-based poet, seem more intimate, the voice more informal, easy—would you say it was easier writing more about your home ground? I also know and love Vermont’s landscape, its pastures, forests, and hillsides, and I consider myself a steward of this land. Though I’m a “flatlander”, I do know and hear in my head the voices and accents of the old-timers here, whether Yankee or French Canadian. Because I’m “at home” here, the voice of my poems might also sound more informal and colloquial. But partly, that’s a pose, because I’m consciously trying to channel that voice, offering readers my interpretation of what Vermont “sounds” like, just as Dr. Williams gave us his version of Paterson-speak. RD: The title seems precise. Yet, obviously, this is not just a compendium of exits and annotations—these poems offer a rich and moving tapestry of histories across Vermont as well as glimpses into the speaker’s past and memories woven in with wry commentary on the present state of a “developed” Vermont, far from a pastoral past—how wedded were you to commentary or narrative as you wrote, as opposed to discrete, lyric focus on moments and spaces? NS: The poems grew over a three-year period in which I visited and re-visited these exits, accreting new material from observation, research, memory, invention, and constant reevaluation. As Robert Frost once said, What begins in delight ends in wisdom. What began for me as a lark, driving the Vermont highways and recording observations of these ramplands on a glorious series of days in May, ended in a weightier consideration and collage of flora and fauna overlaid with human impositions, historical perspectives, and personal memories, all the while maintaining, I hope, some sense of linguistic play. As I’ve noted elsewhere, I very consciously combined poetic modes and tones – narrative, lyric, and de-centered texts; abstract commentary accompanying thick description; news reportage mixed with poetic tropes; serious scrutiny mixed with tomfoolery; factual history mixed with invented “facts” – all of which mirrors, or brings into focus, I hope, the complexities of 21st century Vermont. RD: Was there a specific or unique process behind the drafts of these poems? Was there interplay between them as you tried to pull the work together? NS: My initial drafts were heavy on description and observation, light on analysis and interpretation. I revised these early drafts several times, not only refining the imagery and music of the poems, but also adding analysis and evaluation of the human impositions on the landscape until, finally, I had a “complete” draft. Only after this was accomplished (and saved as a separate document) did I begin to engage with the more playful elements of collage – anagramscrambled phrases, birdcalls, signage (advertisements, street signs) and so on – that, to my mind, made the poems more richly textured and thematically interesting. So, in effect, I created two poems for each exit: a straightforward poem of description and analysis, and a collaged poem with more density and complexity. Over time, I fudged a little on timeframes or weather in order to fit aesthetically or dramatically with the mood of the poems. But I kept the basic title format, wanting the poems to feel, at first blush, like journal entries on a road trip. As for the thematic interplay between poems, I did not consciously try to achieve it. I tried to be receptive to what each exit offered me in the moment of arriving there. If there are echoes between poems, it’s because the same species of birds had arrived from their annual migrations and were singing on those specific May days; the same trees and flowers were in bloom. And the same consciousness (mine, with all of its desires and biases in tow) was responding to the stimuli of a spring day in Vermont. But each exit offered its own unique attractions and distractions. Some exits invited me further afield, farther down the byways and into the surrounding towns, while other exits seemed to keep me close to the highway hillsides. Finally, I should remind you that I visited these places in three consecutive years, on the same exact series of days. Obviously, I could control neither the weather nor the events likely to occur at any exit ramp, so there was inevitable variation from year to year. I chose what I thought was the most interesting “take” (i.e. year) from each exit, sometimes recording it as a discrete “take,” but sometimes adding information from the other two years, if it fit the occasion. RD: All your book titles, interestingly enough—Scavenging the Country for a Heartbeat, I’m Here Because I Lost my Way, This Far from the Source, (T)ravel/Un(t)ravel— carry a sense of travel and search and journey. Where would you say this comes from? I only half-believe him. I think that travel powerfully brings us into contact with the world; it wakes us from our armchair dreams, challenges our cherished comforts, and unravels our cherished certainties. In fact, we may not return from our travels with the same “sad self, unrelenting, identical”. We may, in fact, have actually changed by the time we return home. Along with travel, I also require stasis, some sense of a home base, whether back in my actual American home or in a less permanent abode, where I can settle for six months or a year into the rhythms of daily life, and where I can review and make meaning of my travels. So the rhythm is this: external movement for weeks or months on end into the world; then stasis, where the movement is internal. As for a more autobiographical explanation of why I do what I do, try this on: I grew up in a mill town, Leominster, Massachusetts, in a family with limited economic means; my parents had four children so we could rarely afford to travel. I still remember the billboard on the Route 2 highway that advertised Leominster as the Pioneer Plastic City. 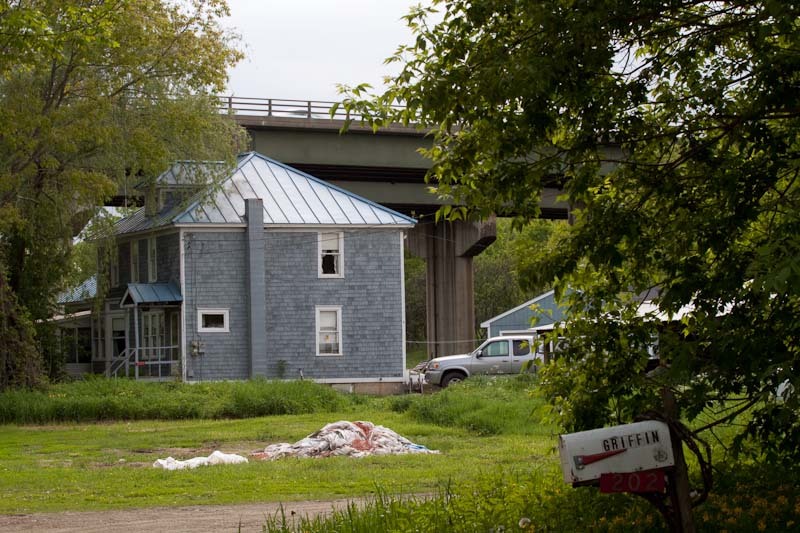 The town often smelled of burning plastics, and the factories along the Nashua River bled a new chemical dye –orange, purple, green – into the waters each day. In the summers, our family escaped to my grandparents’ cottage on the Maine coast, Old Orchard Beach, a demure variation of Coney Island. The salt air, amusement park lights, and polyglot of languages on the boardwalk (English, Yiddish, and Canadian French) enlarged my notion of the world and whetted my appetite for travel. That was the start of it. As soon as I was old enough, high school age, I started hitchhiking around the Northeast, and when I reached my university years (University of Vermont), I hitchhiked coast to coast. Over many years, I continued to travel around America, by thumb, bus, train, car, and at this point, I’ve visited all 50 states. Not until I spent my junior year abroad, at Oxford University, did I set foot on foreign soil, and from that beginning, I’ve traveled many times throughout Western Europe, as well as to Eastern Europe, Russia, China, Southeast Asia, Indonesia, Australia, New Zealand, French Polynesia, Cook Islands, Fiji, and many more obscure ports of entry. I’ve been lucky, as well as determined, to travel widely: the luck involves my having married an anthropologist, who writes the grants, sets up the living arrangements, and allows me to tag along. But sometimes, I get the sabbaticals or teaching-exchanges, as in China, where I taught at a Shanghai university, and my wife tagged along. All told, we spent a year in Shanghai, another year in the Marquesas Islands of French Polynesia, and another year in Paris, as well as many other shorter stints abroad. RD: What would you offer as advice to any poet striving to write from any angle about place—whether it’s place traveled to or traveled from, place situated in, place meditated on, place holding one’s current or past lives? You have to allow yourself to fall into the Void, stripping yourself of your cherished certainties. Only then will you begin to see what there is to see. I think this applies equally to places traveled to (where the language, customs, and mores might be bewildering) and places traveled from (which retain such a heavy weight of the known, the accomplished, the remembered). Somehow, you have to see that remembered place with fresh eyes, and usually, when you leave it, and it is suddenly juxtaposed with wherever you have traveled to, you do see it afresh. What else? To write effectively about place, you must situate yourself both on the edge and, to some degree, near the center. The writer is a perpetual witness, and witnesses need perspective; thus, the outsider status, the outsider view. But the writer must also understand what she is looking at; thus, to get as close as possible to the center of the experience is also desirable for a writer. Visit Neil Shepard on the web at www.NeilShepard.com. Pick up a copy of his book at Amazon or at Big Table Publishing.